While the Apostle Paul was not talking about a new year in these verses, I certainly believe that they relate particularly well to this time of year. As I write these words, only about eight hours remain in 2013. Unless Jesus comes, 2014 will arrive very soon! Like many readers of this blog, I use Facebook as a tool to stay connected with hundreds of friends and family members. Today has brought posts by many people recapping their feelings about 2013. For some, 2013 has been a year of great blessing and joy. They are praying that the new year brings comparable blessings. For others, 2013 has been the most difficult year of their lives, and they look forward with anticipation to a year that hopefully doesn’t bring the same pain. For most of us, 2013 has been a year that cut both ways. It’s been both a year of blessing and a year of tears. No matter which of these categories you may fall into, the reality is that 2014 is almost here and with the turn of the calendar comes a new year to live. A new year of life is nothing to be taken lightly. If the Lord blesses you with another year of life, then by all means make sure you live it to the fullest for Him. That’s what the Apostle Paul was speaking of in Philippians 3:12-14. When he stated that he was “forgetting what lies behind…” he didn’t literally mean that he wouldn’t remember it. In fact, he had been through some unforgettable circumstances in his life! Paul was saying that nothing in the past was going to stop him from living to the fullest in the future. That should be your heart as well. If the Lord has given you life, then He has a purpose for your life. If He has given you life and a purpose for your life, then you have a future. Believe God for it. Go for it. Live with all your heart and all His might! Press on into 2014 with faith and courage. Christmas with the Wise Men (Part 2) – bring your gifts to Jesus! NO MATTER WHAT, BRING YOUR GIFTS TO JESUS. That’s it. No matter what, worship Jesus, pray to Jesus, love Jesus. No matter what, bring your gifts to Jesus. Perhaps you are one of the fortunate people who will read this blog and couldn’t imagine life being much better. You are blessed, healthy, and happy. You are positive about life and you really don’t have any real point of pain at present in your life. If that describes you, then no matter what, bring your gifts to Jesus. He is the reason for every blessing and the Giver is far greater than any gift. However, the overwhelming majority of those who read this blog post will have a point of pain in their life. Some will have crushing pain and a broken heart: a marriage that ended this year, the first Christmas without a loved one, a child that is on the wrong track, constant family conflict, never-ending financial pressure, a struggle with depression, etc. For most of us, we don’t have a crushing pain, but we do have some pain – some situation(s) that we wish with all of our heart were different. The approach of Christmas Day is a painful approach. Like the wise men, no matter what, bring your gifts to Jesus. Today my wife Becky and I celebrated our 20th anniversary. 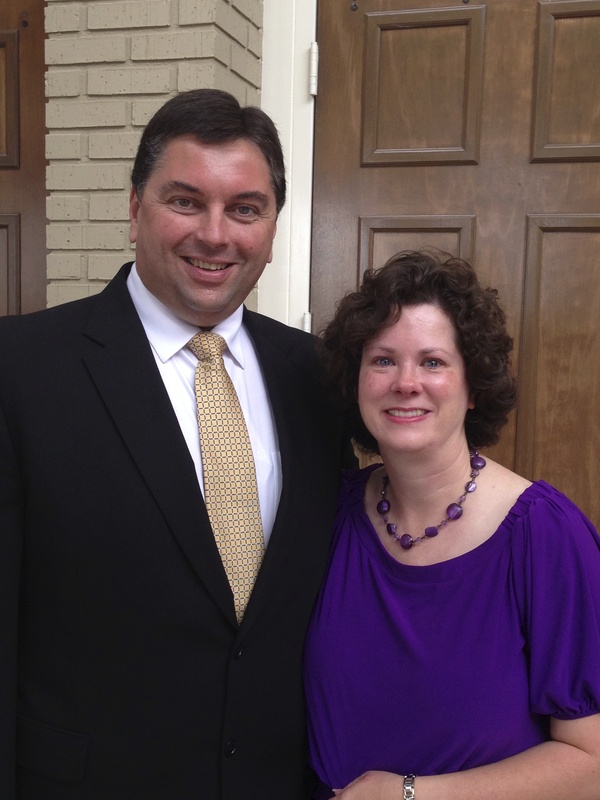 On December 18, 1993 at Rainsville First Baptist Church we became husband and wife, beginning a wonderful journey together. Here we are a few weeks ago. She gets prettier by the year, doesn’t she? 1) Don’t expect your spouse to be perfect. Extending grace is an important aspect of marriage. 2) Focus on meeting the needs of your spouse before you focus on your own needs. 3) Work hard on your marriage just like you work hard on other things in life. 4) Forgive. Nothing is worth living in bitterness toward your spouse. 5) NEVER criticize your spouse in front of other people. 6) Pray for your spouse and with your spouse. Christmas with the Wise Men (Part 1) – See the light and come to Jesus! The wise men saw the light and came to Jesus. It’s that simple. Take a few moments and read John 1:1-14 and see how the birth of Christ is portrayed there as a light shining into a dark world. The wise men are literal examples of those who see the light of Christ and come to Him. Even as I type these words, I get excited because of the reality of my salvation. As an eight year old boy, I saw the light of Christ and came to Jesus. Did I see a star like those guys? No. Actually, I “saw the light” in that I understood who Jesus is and I understood my sinfulness and need for a Savior. You see, light enables us to see. Once I saw Jesus and saw myself – I placed my faith in Him as Savior. In August 1978, Greg Corbin saw the light and came to Jesus. Praise the Lord! Perhaps you are reading this blog and you are not a Christian. I would love to connect with you and help you along the road to faith in Him. Go to the “contact” section of this blog and I would love to hear from you.